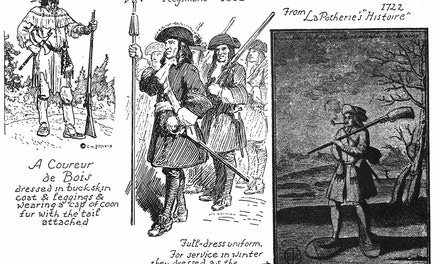 Among the instruments used by travellers to find their positions was the cross-staff, generally in use on ships. It consisted of a staff, along which was slid a cross-bar set at right angles, which could be fixed tightly at any required distance by a screw. The observer applied his eye to one end of the staff and raised it until it was in line with the sun or star by which he measured. He then moved the cross-bar along the staff until its lower extremity touched the horizon. If the sun was high, the distance from the near end of the staff to the bar was short; if low, the bar would have to be moved farther along the staff. This was marked at regular intervals, which gave the degree of the sun's altitude above the horizon. From this the observer could calculate roughly his position. The astrolabe was a flat circular plate of brass, divided intoadegrees, across the face of which moved a bar pivoted on the centre. The bar was pierced with an eyelet through which the traveller sighted the sun. The point on the circle at which the bar rested when in line with the eye and the sun gave the degree of the sun's elevation. From this angle the latitude was calculated. In order to take a correct observation it was necessary to hold the astrolabe in an exactly perpendicular position. It was therefore suspended by a ring at the top from the thumb or finger of the observer, or from the projecting branch of a tree, or, if on shipboard, from some portion of the rigging. The astrolabe was slightly thicker at the bottom and had a short projection to give it more steadiness when thus suspended. 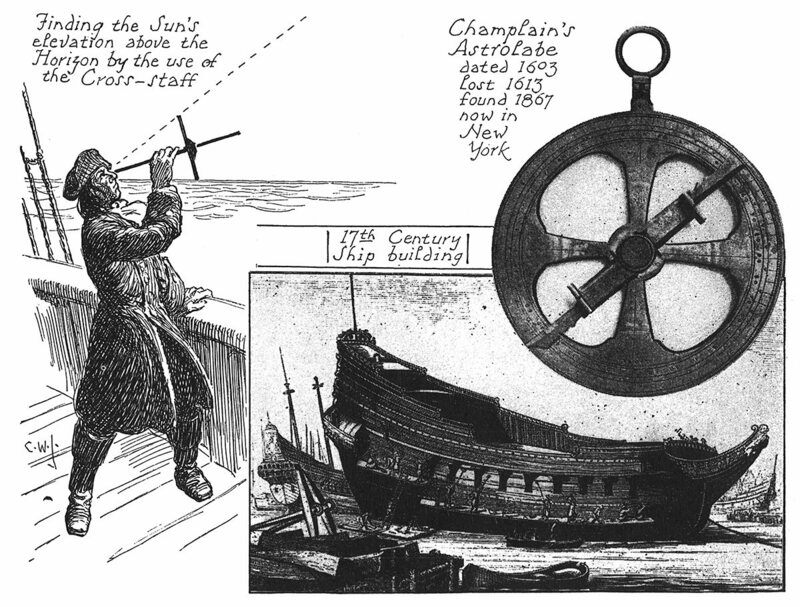 Some pictures show Champlain holding an astrolabe by this projection at the base, supposing that it was a handle, but this was not the way it was used. 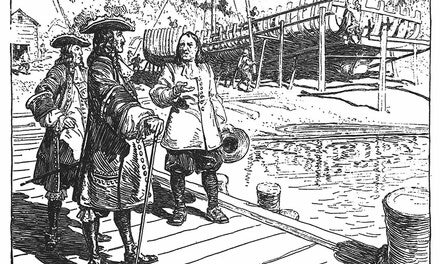 See picture on page 92, showing Champlain using his astrolabe on the Ottawa, and Canada's Past in Pictures for the story of its loss and recovery. The astrolabe was superseded by the quadrant and the sextant in taking astronomical observations.